One man, known as “Niz,” survived a third attempt on his life last month in a shooting incident which is said to have killed two bystanders. Another man known as “Masood” has twice avoided kidnapping by insurgents who he says have pledged to kill him for “betraying Muslims” and collaborating with the British and other occupying forces. Masood is believed to have worked alongside actor and filmmaker Ross Kemp when he made a series of documentaries about British soldiers fighting in southern Afghanistan. The interpreter was badly wounded during that period after being shot during a firefight. The men’s stories have emerged less than a month after another interpreter who served alongside UK forces in combat, and was later refused asylum in Britain despite the dangers he faced, was reported to have been shot by the Taliban. That interpreter, identified only as “Chris,” the nickname given to him by British troops, was shot in the leg during an assassination attempt near his home in Khost Province, eastern Afghanistan. The 26-year-old interpreter’s infant son was also wounded in what he says was just the latest attempt to kill or capture him by insurgents, who also see him as a collaborator with the US-led occupation of the country. All three say they are living in hiding, moving between safe houses dotted around Afghanistan. Chris claims he has fallen foul of a legal stipulation which dictates that resettlement rights are only available to those who contributed at least a year’s continuous service after December 2011. He served between 2008 and 2011. Only one interpreter out of over 300 who served with UK forces has been given leave to resettle in Britain. In January, a British appeal court ruled that MPs must offer a response to claims that the government failed to extend equal treatment to Afghan and Iraqi interpreters. 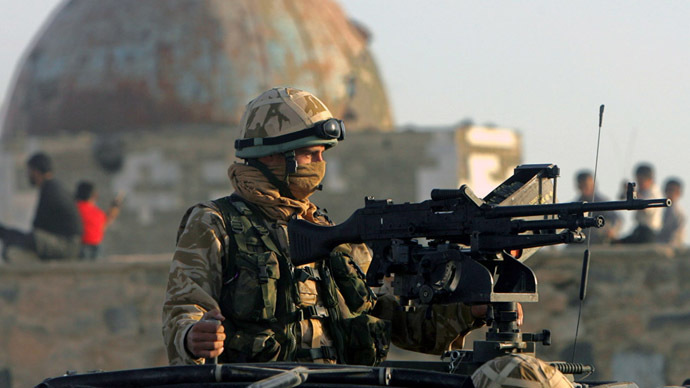 When UK forces withdrew from Iraq, local interpreters who had worked for the British forces were offered a special assistance program.